Found Art: Animal Portraits at Gentle Barn! Also while I was away on vacation, my friends and I visited The Gentle Barn in Santa Clarita. The Gentle Barn is a farm sanctuary for abused animals. The kind folks there spend countless hours dedicated to rehabilitating the animals, restoring their spirits and their trust in humans. It was a really nice experience because it really did feel very peaceful there. The animals were really hot because the weather was scorching that day, haha, but they looked happy. I was surprised at how at ease they were around so many people. Even chickens and turkeys allowed people to pet them! I’d never seen that before. I also had never been sneezed on by a horse before then, but hey I guess there’s a first time for everything. As it turns out, it isn’t any better or worse than getting sneezed on by a human – I’d still just rather not get sneezed on. 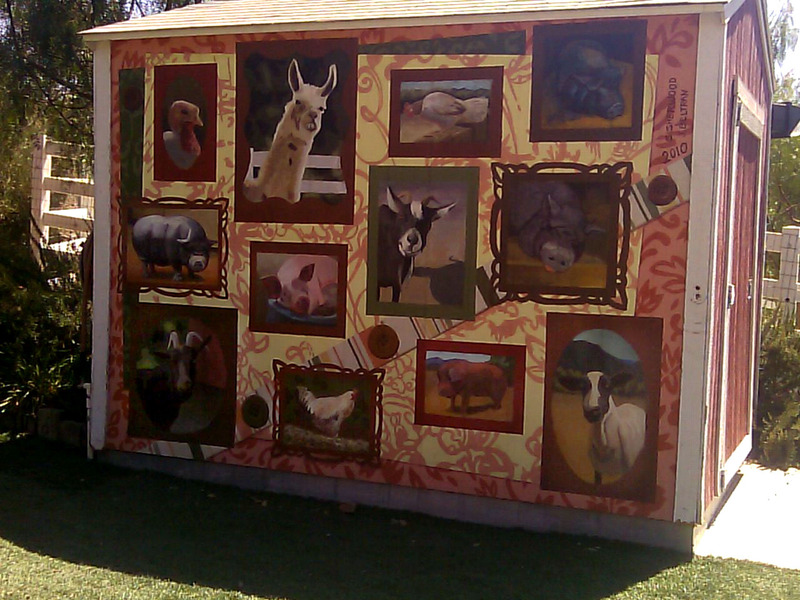 While I was there I made sure to capture this barn with portraits of some of the animals that live on the farm. My personal favorite has to be the one of the llama! It looks like it’s cheesing! haha The mural seemed to match the down-to-earth, family feel of The Gentle Barn. I just HAD to post it based on the sheer patience it must have taken to not only paint so many different animals in one space, but to also be able to convey their personalities. You have to admit that it’s so dang cute, haha. This entry was posted in Found Art, Portraits by Traci Turner. Bookmark the permalink.